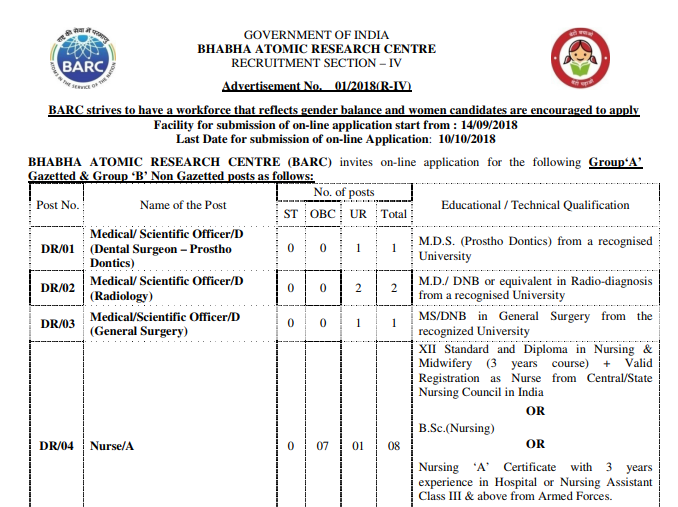 BARC Nurse/A & Scientific Assistant/B (Radiography) Recruitment 2018: 17 Vacancies – With Online Application Forms yet to be released on 14th September 2018, Board of Controller of Examination, Bhabha Atomic Research Centre has recently informed about recruitment drive for 17 vacant posts. 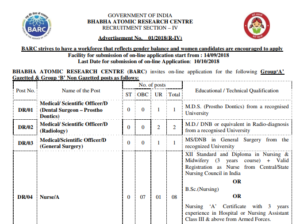 Vacancies are unequally divided as 05 for Scientific Assistant / B (radiography), 08 for Nurse / A, 01 for Medical / Scientific Officer / D (General Surgery), 02 for Medical/ Scientific Officer / D (Radiology) and 01 vacancy for Medical/ Scientific Officer/ D (Dental Surgeon – Prostho Dontics). Required respective educational qualifications are Bachelor of Science (Radiography) OR diploma (radiography); XII class, Diploma in Nursing & Midwifery + valid registration as Nurse/ Bachelor of Science (Nursing)/ Nursing ‘A’ Certificate with relevant experience; MS/ DNB (General Surgery); MD / DNB (Radio Diagnosis) and MDS (Prostho Dontics). Posts are categorised under Gazetted & Group ‘B’ non gazetted. At the end of official notification, Checklist for the candidates is also provided which contains the list of all the documents required along with application certificate that needs to be sent. List includes Print out of the On-line Application, Date of Birth/ proof of age (certificate), scheduled caste/ scheduled tribe/ other backward class (if applicable), No objection certificate (if applicable), educational and professional qualifications (certificates and mark sheets), experience certificate and any other relevant certificates.